Movies are made to entertain! Movies can make you think, teach you a lesson, or just let you escape into a fantasy world for a few hours. 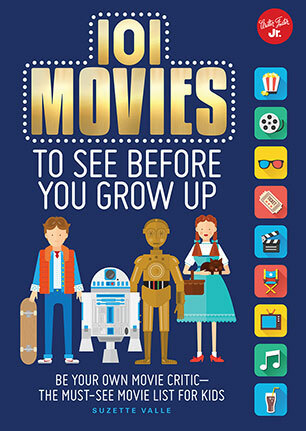 This book serves as an interactive bucket list of films for children ages 8 and up to watch before they grow up. 101 Movies to See Before You Grow Up goes beyond mainstream films. From contemporary to classic films, the list offers a wide selection of must see movies. The book is divided into categories and acts as an interactive film journal where kids can document when they see the movie, if they liked it, and how they would rate it. Each page focuses on a single movie with basic information about each film, including the director, runtime, rating, and date of release. There is also a Film Critic section at the bottom of each page that allows young movie buffs to write in their own opinions and observations about the movie. 101 Movies to See Before You Grow Up is the perfect handbook for movie-lovers of all ages, helping both kids and parents choose classic and contemporary movies appropriate for the entire family. Suzette Valle is an award-winning mother and freelance writer focusing on family entertainment. She graduated with a B.A. from the University of San Diego, and has a Master's Degree from Oxford University, England. Suzette has been a director and board member of several non-profit organizations in her community, including the Parent Teacher's Association, Islander Sports Foundation, and is currently a board member of the San Diego-based international charity Foundation for Women. She also has her own blog, Mamarazzi Knows Best.com, where she writes about parenting in a celebrity-driven society and all aspects of entertainment. Suzette lives in the seaside town of Coronado, California. This enchanted island is also known as the Emerald City because L. Frank Baum, author of The Wonderful Wizard of Oz, penned several of the Oz books here. Suzette enjoys watching movies, and walks on the beach with her husband of 24 years and Bella, her adorable dog.